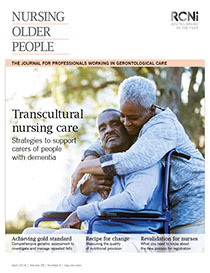 This is the second article in a short series that presents case study examples of the use of comprehensive geriatric assessment (CGA) in different clinical settings. CGA is a holistic assessment model designed to determine frail older people’s medical and mental health status, as well as functional, social and environmental issues. When applied by nurses, it can enable individualised planning for health, safety and wellbeing. This article presents the case of an older man who had a three-month history of falls. After his most recent fall he was admitted to an emergency department, where examination identified no significant abnormal pathology, and subsequently to a nurse-led older person’s clinic. The article describes how a CGA approach was adopted to assess the man, establish an underlying diagnosis of Parkinson’s disease, and develop a personalised care plan to address immediate falls risk and long-term planning.